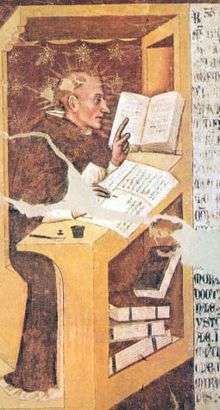 The Dominican friar Vincent of Beauvais (Vincentius Bellovacensis or Vincentius Burgundus) (c. 1190 – 1264?) wrote the Speculum Maius, the main encyclopedia that was used in the Middle Ages. The exact dates of his birth and death are unknown, and not much detail has surfaced concerning his career. Conjectures place him first in the house of the Dominicans at Paris between 1215 and 1220, and later at the Dominican monastery founded by Louis IX of France at Beauvais in Picardy. 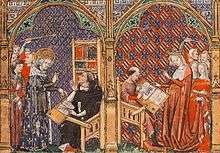 It is more certain, however, that he held the post of "reader" at the monastery of Royaumont on the Oise, not far from Paris, also founded by Louis IX, between 1228 and 1235. The king read the books that Vincent compiled and supplied the funds for procuring copies of such authors as he required. Queen Margaret of Provence and her son-in-law, Theobald V of Champagne and Navarre, are also named among those who urged him to the composition of his "little works", especially De morali principis institutione. Though Vincent may well have been summoned to Royaumont even before 1240, there is no actual proof that he lived there before the return of Louis IX and his wife from the Holy Land, early in the summer of 1254; but it is evident that he must have written his work De Eruditione Filiorum Nobilium (where he styles himself as "Vincentius Belvacensis, de ordine praedicatorum, qualiscumque lector in monasterio de Regali Monte") after this date and yet before January 1260, the approximate date of his Tractatus Consolatorius occasioned by the death of the king's son Louis that year. Vincent's Speculum Maius (The Great Mirror), the compendium of all of the knowledge of the Middle Ages, seems to have consisted of three parts: the Speculum Naturale, Speculum Doctrinale and Speculum Historiale. All the printed editions, however, include a fourth part, the Speculum Morale, added in the 14th century and mainly compiled from Thomas Aquinas, Stephen de Bourbon, and a few other contemporary writers. The vast tome of the Speculum Naturale (Mirror of Nature), divided into thirty-two books and 3,718 chapters, is a summary of all of the science and natural history known to Western Europe towards the middle of the 13th century, a mosaic of quotations from Latin, Greek, Arabic, and even Hebrew authors, with the sources given. Vincent distinguishes, however, his own remarks. Vincent de Beauvais first completed the Speculum Naturale in year 1244. He completed a second and expanded version in 1259 or 1260. The Speculum Naturale deals with its subjects in the order that they were created: it is essentially a gigantic commentary on Genesis 1. Thus, book i. opens with an account of the Trinity and its relation to creation; then follows a similar series of chapters about angels, their attributes, powers, orders, etc., down to such minute points such as their methods of communicating thought, on which matter the author decides, in his own person, that they have a kind of intelligible speech, and that with angels, to think and to speak are not the same process. Book ii. treats of the created world, of light, color, the four elements, Lucifer and his fallen angels and the work of the first day. Books iii. and iv. deal with the phenomena of the heavens and of time, which is measured by the motions of the heavenly bodies, with the sky and all its wonders, fire, rain, thunder, dew, winds, etc. Books v.-xiv. treat of the sea and the dry land: the discourse of the seas, the ocean and the great rivers, agricultural operations, metals, precious stones, plants, herbs with their seeds, grains and juices, trees wild and cultivated, their fruits and their saps. Under each species, where possible, Vincent gives a chapter on its use in medicine, and he adopts for the most part an alphabetical arrangement. In book ix., he gives an early instance of the use of the magnet in navigation. Book xv. deals with astronomy: the moon, the stars, the zodiac, the sun, the planets, the seasons and the calendar. Books xvi. and xvii. treat of fowls and fishes, mainly in alphabetical order and with reference to their medical qualities. Books xviii.-xxii. deal in a similar way with domesticated and wild animals, including the dog, serpents, bees and insects; they also include a general treatise on animal physiology spread over books xxi.-xxii. Books xxiii.-xxviii. discuss the psychology, physiology and anatomy of man, the five senses and their organs, sleep, dreams, ecstasy, memory, reason, etc. The remaining four books seem more or less supplementary; the last (xxxii.) is a summary of geography and history down to the year 1250, when the book seems to have been given to the world, perhaps along with the Speculum Historiale and possibly an earlier form of the Speculum Doctrinale. The second part, Speculum Doctrinale (Mirror of Doctrine), in seventeen books and 2,374 chapters, is intended to be a practical manual for the student and the official alike; and, to fulfil this object, it treats of the mechanic arts of life as well as the subtleties of the scholar, the duties of the prince and the tactics of the general. It is a summary of all the scholastic knowledge of the age and does not confine itself to natural history. It treats of logic, rhetoric, poetry, geometry, astronomy, the human instincts and passions, education, the industrial and mechanical arts, anatomy, surgery and medicine, jurisprudence and the administration of justice. The first book, after defining philosophy, etc., gives a long Latin vocabulary of some 6,000 or 7,000 words. Grammar, logic, rhetoric and poetry are discussed in books ii. and iii., the latter including several well-known fables, such as the lion and the mouse. Book iv. treats of the virtues, each of which has two chapters of quotations allotted to it, one in prose and the other in verse. Book v. is of a somewhat similar nature. With book vi., we enter on the practical part of the work: it gives directions for building, gardening, sowing and reaping, rearing cattle and tending vineyards; it includes also a kind of agricultural almanac for each month in the year. Books vii.-ix. have reference to the political arts: they contain rules for the education of a prince and a summary of the forms, terms and statutes of canonical, civil and criminal law. Book xi. is devoted to the mechanical arts, of weavers, smiths, armourers, merchants, hunters, and even the general and the sailor. Books xii.-xiv. deal with medicine both in practice and in theory: they contain practical rules for the preservation of health according to the four seasons of the year and treat of various diseases from fever to gout. Book xv. deals with physics and may be regarded as a summary of the Speculum Naturale. Book xvi. is given up to mathematics, under which head are included music, geometry, astronomy, astrology, weights and measures, and metaphysics. It is noteworthy that in this book, Vincent shows a knowledge of the Arabic numerals, though he does not call them by this name. With him, the unit is termed "digitus"; when multiplied by ten it becomes the "articulus"; while the combination of the articulus and the digitus is the "numerus compositus". In his chapter xvi. 9, he clearly explains how the value of a number increases tenfold with every place it is moved to the left. He is even acquainted with the later invention of the cifra, or cipher. The last book (xvii.) treats of theology or mythology, and winds up with an account of the Holy Scriptures and of the Fathers, from Ignatius and Dionysius the Areopagite to Jerome and Gregory the Great, and even of later writers from Isidore and Bede, through Alcuin, Lanfranc and Anselm, down to Bernard of Clairvaux and the brethren of St Victor. Two royal visits to respectively the author and translator of Vincent's Speculum Historiale translated into French by Jean de Vignay as Le Miroir historial, c. 1333. At left Saint Louis visits Vincent. The most widely disseminated part of the Speculum Maius was the Speculum Historiale, which provided a history of the world down to Vincent's time. It is based on the Chronicon of Helinand of Froidmont (d. c. 1229). It was a massive work, running to nearly 1400 large double-column pages in the 1627 printing. The first book opens with the mysteries of God and the angels, and then passes on to the works of the six days and the creation of man. It includes dissertations on the various vices and virtues, the different arts and sciences, and carries down the history of the world to the sojourn in Egypt. The next eleven books (ii.-xii.) conduct us through sacred and secular history down to the triumph of Christianity under Constantine. The story of Barlaam and Josaphat occupies a great part of book xv. ; and book xvi. gives an account of Daniel's nine kingdoms, in which account Vincent differs from his professed authority, Sigebert of Gembloux, by reckoning England as the fourth instead of the fifth. In the chapters devoted to the origins of Britain, he relies on the Brutus legend, but cannot carry his catalogue of British or English kings further than 735, where he honestly confesses that his authorities fail him. Seven more books bring the history to the rise of Muhammad (xxiii.) and the days of Charlemagne (xxiv.). Vincent's Charlemagne is a curious medley of the great emperor of history and the champion of romance. He is at once the gigantic eater of Turpin, the huge warrior eight feet high, who could lift the armed knight standing on his open hand to a level with his head, the crusading conqueror of Jerusalem in days before the crusades, and yet with all this the temperate drinker and admirer of St Augustine, as his character had filtered down through various channels from the historical pages of Einhard. Book xxv. includes the first crusade, and in the course of book xxix., which contains an account of the Tatars, the author enters on what is almost contemporary history, winding up in book xxxi. with a short narrative of the crusade of St Louis in 1250. One remarkable feature of the Speculum Historiale is Vincent's constant habit of devoting several chapters to selections from the writings of each great author, whether sacred or profane, as he mentions him in the course of his work. The extracts from Cicero and Ovid, Origen and St John Chrysostom, Augustine and Jerome are but specimens of a useful custom which reaches its culminating point in book xxviii., which is devoted entirely to the writings of St Bernard. An aspect of the Speculum Historiale is the large space devoted to miracles. Four of the medieval historians from whom he quotes most frequently are Sigebert of Gembloux, Hugh of Fleury, Helinand of Froidmont, and William of Malmesbury, whom he uses for Continental as well as for English history. Other works of Vincent of Beauvais include De eruditione filiorum nobilium ("The education of noble children") and De morali principis institutione ("The moral instruction of a prince"), which were to have been the fourth and first books of a proposed four-part treatise, the Opus universale de statu principis ("Universal work on the status of a prince"). He also wrote the Tractatus consolatorius de morte amici ("Consolation upon the death of a friend"), addressed to Louis upon the death of his son Louis in 1260. It has been suggested that he wrote the Speculum Humanae Salvationis. Although Vincent cannot be considered an original writer, his immense industry in collecting, classifying and arranging these three huge volumes of 80 books and 9885 chapters to combine all Western knowledge into a single whole can only impress. Arguably no wider compilation was made until the Enlightenment encyclopedias many centuries later. The number of writers quoted by Vincent is huge: in the Speculum Naturale alone no less than 350 distinct works are cited, and to these must be added at least 100 more for the other two Specula. His reading ranges from Arabian philosophers and naturalists to Aristotle, Eusebius, Cicero, Seneca, Julius Caesar (whom he calls Julius Celsus), and Peter Alphonso. But he seems to have known Hebrew, Arabic and Greek authors only through their popular Latin versions. He admits that his quotations are not always exact, but asserts that this was the fault of careless copyists. 1 2 3 4 5 6 7 8 9 10 11 12 13 14 15 16 Archer 1911, p. 90. ↑ Vincent de Beauvais @ Archives de littérature du Moyen Âge (ARLIMA.net). Likewise reported in the book Schooling and Society: The Ordering and Reordering of Knowledge in the Western Middle Ages, year 2004 on page 102. ↑ Archer 1911, pp. 90, 91. 1 2 3 4 5 6 7 8 9 10 11 Archer 1911, p. 91. This article incorporates text from a publication now in the public domain: Archer, Thomas Andrew (1911). "Vincent of Beauvais". In Chisholm, Hugh. Encyclopædia Britannica. 28 (11th ed.). Cambridge University Press. pp. 90, 91. Brother Potamian (1913). "Vincent of Beauvais". In Herbermann, Charles. Catholic Encyclopedia. New York: Robert Appleton Company. 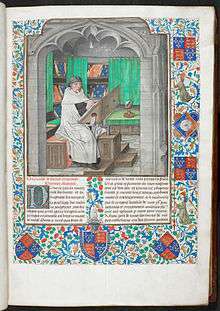 Wikimedia Commons has media related to Vincent de Beauvais. Vincent of Beauvais website, (under construction). An even more massive and up-to-date bibliography of Vincent de Beauvais' works (Archives de littérature du Moyen Âge - Arlima). Speculum naturale (Google Books), Hermannus Liechtenstein, 1494. (French) A chronology about life, works and context of Vincent of Beauvais and a study bibliography about the De morali principis institutione, on the personal page of Emmanuel Wald ((English) / (French)). Speculum Historiale. XI-XVI. Naples, before 1481. Speculum Historiale. XVII-XXI. Naples, before 1481. Speculum Historiale. XXVI-XXIX. Naples, before 1481.